NOTE: Many of the RCPT plans and tools can be accessed through the Regional Logistics Program's website. Access to these plans is restricted to registered and approved users. To register for an account click here. The RCPT reserves the right to deny access to restricted documents. Catastrophes create an enormous need for information and resources as well as cascading problems, both expected and new, across multiple jurisdictions. To effectively respond to all of this requires stakeholders throughout a region to coordinate resource needs, share information and work together as one. The goal of the Regional Catastrophic Plans is to provide the information and tools that will enable this effective response, preventing loss of life and damage to property and supporting field operations and executive decision makers alike. 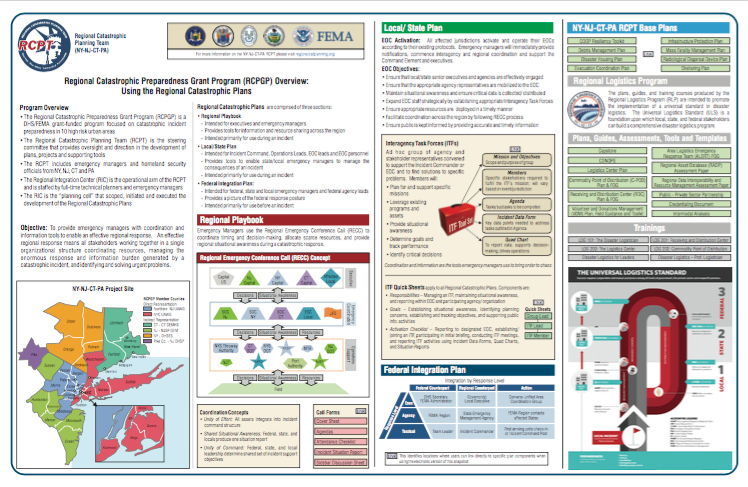 The plans offer emergency managers, and their partners, information on different hazards, available resources and likely local, state and federal stakeholders. Some of the tools found in each plan include task lists, organization charts, conference call forms and critical information dashboards. The Regional Catastrophic Plans are actually three plans in one. Each "plan within the plan" has a specific objective intended for different users. Each Regional plan begins with a Regional Playbook. This section is strategic in nature and is intended for executives and emergency managers to use during an incident. The Regional Playbook provides tools that help with sharing information and resources across a region. The Local/State Plan, found in the majority of the plans, is geared more towards the operational level of a response. This section is intended for Incident Command, Operations Leads, EOC leads and EOC personnel. The tools found here enable state/local emergency managers to anticipate and solve problems, to better manage the consequences of an incident. Having a picture of the federal response posture and assistance programs relevant to response missions before an incident can help emergency managers at all levels know what is expected. The Federal Integration Plan (FIP), found in almost all of the plans, provides this picture. The FIP details the programs and resources the various Federal agencies can bring to bear, the information needed to expedite the request, the resources needed to be able to accept/implement the program or resource and any obstacles that might hinder the request, acceptance and/or implementation. Plans are rounded out with mission specific Annexes that provide not only a glossary and acronyms but preparedness information and much more.